The Samsung Galaxy F is the long-anticipated premium, metal-clad flagship from Samsung, and while it’s not yet out, it continuous leaking out. 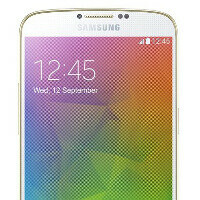 Today, @evleaks has shared what looks like a very official press render of the Galaxy F… and it looks similar to the Galaxy S5, of course. You can’t expect wonders from Samsung, can you? Good news is that it’s not just identical to the Galaxy S5 - the bezels are obviously smaller, which would make the Galaxy F more compact. And it’s not the first time we see this Galaxy F (it’s the same phone, we’ve seen earlier referred to as Galaxy S5 Prime) - leaks have already revealed what looks like a metallic back plate, and the same rear setup as in the S5, with a heart monitor and the protruding camera. So far, rumors agree that the Galaxy F is likely to have a slightly larger than the S5, 5.3-inch display, but the actual resolution seems to not have been set in stone just yet - some claim the screen on the device will be of the new, Quad HD (1440 x 2560-pixel) kind, while others think that it’d be a 1080p phone. The rest of the specs are pretty much agreed on by leaksters - a new Snapragon 805 system chip, and a 16-megapixel camera, likely to sport a Samsung-made sensor. Well, with so much smoke, we sure hope there is fire, and Samsung will officially unveil the Galaxy F soon. If the Galaxy F going to be dust/water proof like the S5? I haven't been keeping up with the Galaxy F. I must admit, it does look WAY better than the S5. LOVE the slim bezels. Pic number 6 is impressive. I like it. I'll keep my Note 3 for now and upgrade when the Note 4 comes out. Imagine a Galaxy Note 4 F?!? Mind = Blown!!! Looks better than the S5 but still ugly unfortunately. 12 September. Galaxy F and note 4? September 12 on Wednesday won't come until 2018. Evleaks gone insane? He's starting to post concept phones now?